Tumor-associated macrophages play a critical role in breast tumor progression; however, it is still unclear what effector molecular mechanisms they employ to impact tumorigenesis. Ferritin is the primary intracellular iron storage protein and is also abundant in circulation. In breast cancer patients, ferritin is detected at higher levels in both serum and tumor lysates, and its increase correlates with poor clinical outcome. In this study, we comprehensively examined the distribution of ferritin in normal and malignant breast tissue at different stages in tumor development. Decreased ferritin expression in cancer cells but increased infiltration of ferritin-rich CD68-positive macrophages was observed with increased tumor histological grade. Interestingly, ferritin stained within the stroma surrounding tumors suggesting local release within the breast. In cell culture, macrophages, but not breast cancer cells, were capable of ferritin secretion, and this secretion was further increased in response to pro-inflammatory cytokines. We next examined the possible functional significance of extracellular ferritin in a breast cancer cell culture model. 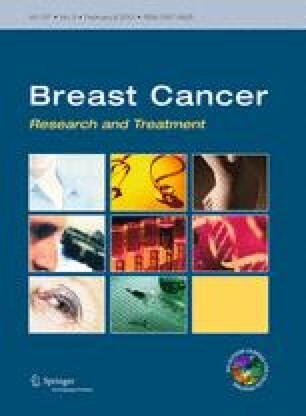 Ferritin stimulated the proliferation of the epithelial breast cancer cell lines MCF7 and T47D. Moreover, this proliferative effect was independent of the iron content of ferritin and did not increase intracellular iron levels in cancer cells indicating a novel iron-independent function for this protein. Together, these findings suggest that the release of ferritin by infiltrating macrophages in breast tumors may represent an inflammatory effector mechanism by which ferritin directly stimulates tumorigenesis. The online version of this article (doi: 10.1007/s10549-012-2405-x) contains supplementary material, which is available to authorized users. The experiments presented in this manuscript comply with the current laws and standards of the USA and have been approved by the institutional review board at Penn State Hershey Medical Center.